Moringa is the greatest well-known supplement ever discovered by humankind. Moringa was named the “Elixir Tree” as a result of all elements of the tree are used as food and medication. Moringa has been used worldwide to deal with malnutrition. it’s one in every of the most nutrient dense plants in the world. Daily use of Moringa will facilitate add essential nutrition and minerals to the diet. Moringa boosts overall energy levels and helps to increase stamina and vitality. 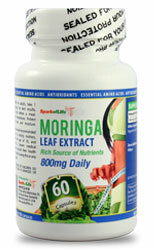 Spark of Life Moringa Leaf Extract is a rich source of nutrients and may support healthy weight management. For adults, take two (2) vegetable capsules, two times per day with water. Each bottle contains 60 capsules. Contains 400mg of of Moringa Oleifera (leaf) powder.